A line of students, staff and community members spilled out of Kagin and down the Grand Avenue sidewalk last Saturday to hear Minnesota Senator Al Franken and Massachusetts Senator Elizabeth Warren speak. “I was thrilled to enter Kagin and to see an absolutely packed room,” said Mac Dems co-chair Joe Klein ’16. 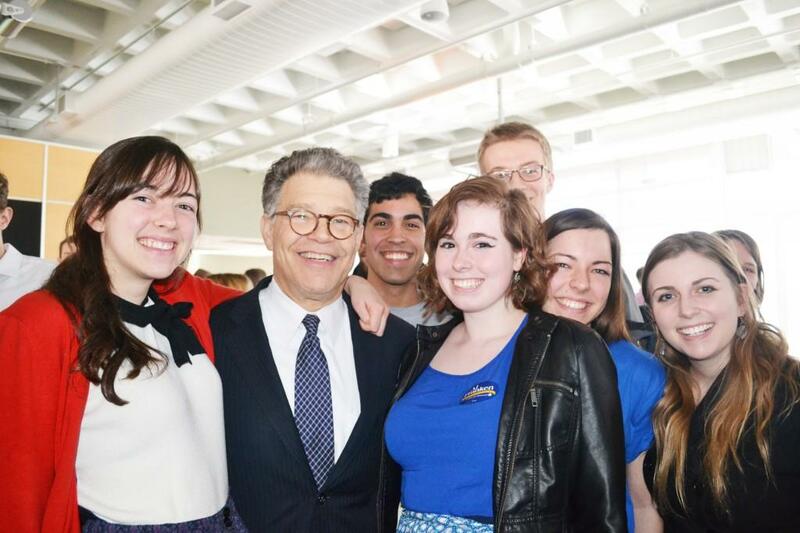 Macalester students meet with Sen. Al Franken after the event. “There was a lot of planning that went into the event, but there were also a lot of really capable, passionate people who helped make it happen,” said Mac Dems co-chair Margaret Mulligan ’16. The event, which opened at 1:00 pm and quickly filled the Hill Ballroom to capacity, was put on by Mac Dems and the DFL and featured multiple speakers aiming to raise awareness of Franken’s campaign for re-election this November and the role that Macalester students can play in the campaign. Starting with Minnesota House Majority Leader Erin Murphy, who represents Macalester’s district, the speakers stressed not only the importance of a single vote, but also what Franken has done during his time in the senate to support college students and the middle class. Rep. Bobby Joe Champion ’86 also called for students to put their votes towards Franken’s re-election. Franken won his first election in 2008 by a narrow margin of 312 votes after a lengthy recount process in which then-Senator Norm Coleman appealed Franken’s victory. Since then, Franken has become a “tireless champion,” as described by St. Paul Mayor Chris Coleman, in fighting for lower college tuition, lower healthcare costs, and advocating against poverty, the equity gap, and sexual assault and harassment in the workplace. Franken and Warren entered the stage at the same time and were met with a standing ovation from the crowd. Franken started off almost immediately with a quick hint to his past as a satirist. Senators Warren and Franken received a standing ovation from the Macalester community. “It’s 2014, Democrats are doomed, and it’s all your fault,” he said drily as the crowd laughed. Franken also pointed to his narrow margin of victory in 2008 and how that had only been accomplished through hard work and young voter turnout. According to Franken, Democrats suffered a loss of power in 2010 because young voters didn’t show up to the polls. “Sometimes people make the mistake of thinking that college is all that college students care about,” Franken said, listing things like health care, climate change, the recession and birth control as things that college students are aware of and invested in. Warren focused her part of the event again on the importance of re-electing Franken and working towards a more progressive future. “It has been an honor to be in the U.S. Senate with Al,” Warren said. Sen. Franken listens as Sen. Warren addresses the audience. Warren cited the period from 1930 to 1980 in the United States as a period of great social and political change, saying that government helped bring about these positive changes by investing in education, infrastructure and research. She also conveyed her disappointment that these values seem to have fallen off the table in more recent years. Warren reiterated some of what Franken had already touched on, adding the importance of stopping oil subsidies to big companies and putting that money instead towards education. She also mentioned the importance of allowing “workers to come together and bargain collectively,” of moving more people above the poverty line, and other reforms that she wanted to see in the years to come. “Senator Franken talks a good game about helping average Minnesotans, but young people in Minnesota are tired of his talking points,” said Andrew Ojeda, a Macalester alum and 2012 candidate for the school’s state House district. “Franken supported Obamacare, which has proven to be a raw deal for young Minnesotans,” added another Mac GOP member. Mulligan agreed. “Warren is … a phenomenal public speaker, and her presence helped to facilitate an environment that recharged and empowered us,” she said. Editor’s Note: News Editor Joe Klein was not involved in the production of this story.